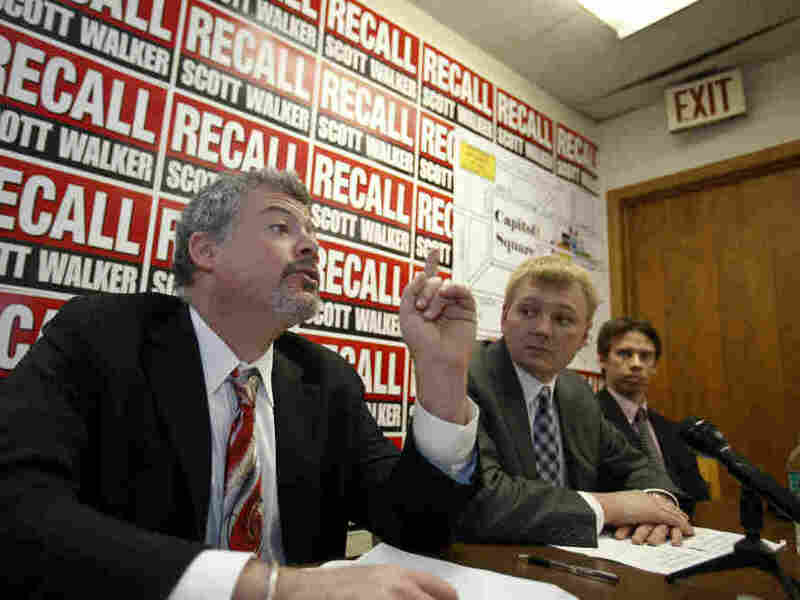 Wisconsin Democrats Exceed Million-Signature Mark For Walker Recall : It's All Politics How badly do Wisconsin Gov. Scott Walker's opponents want him out of office? So badly they collected significantly more signatures than they needed to ensure a recall election for the governor. We're talking more than a million signatures, according to the Democrats who, to meet the Tuesday deadline, were hauling boxes of documents to the state office responsible for reviewing them. Jeremy Levinson, (l) a lawyer to the recall committees, talks about the petitions as Mike Tate (c) Wisconsin Democratic Party chair listens, Tuesday, Jan. 17, 2012. How badly do Wisconsin Gov. Scott Walker's opponents want him out of office? So badly they collected significantly more signatures than they needed to ensure a recall election for the governor. A lot more. We're talking more than a million signatures, according to Wisconsin Democrats who, in order to meet the Tuesday deadline, were hauling boxes of documents to the state office responsible for reviewing them. The sheer number of signatures being filed - nearly as many as the total votes cast for Walker in November 2010, and almost twice as (many as) those needed to trigger a recall election - ensure the election will be held, said officials with the state Democratic Party and United Wisconsin, the group that launched the Walker recall. Former U.S. Rep. Dave Obey, who has been in state politics for a half-century, called the recall effort "an amazing development." But, "what is unprecedented is the way that the governor and his allies ran roughshod over normal legislative and political procedures," said Obey, declining to say whether he might run against Walker. "He's abused the very process that elected him, and that's what's got people so angry." Walker was in New York City raising money Tuesday. But he took time out to talk with Rush Limbaugh, which should help the money-raising efforts as well. Walker sounded fairly confident, which always helps when you're a politician asking people to make those cash contributions to your campaign war chest. He blamed big labor unions, accusing them of seeking to fatten themselves on the dues of public workers. He warned of "shenanigans" by alleging that many of the signatures were likely to be invalid. He said he would counter the recall effort with a massive grassroots operation of his own. WALKER: "The verification process will probably take at least a month if not longer. We believe, based upon that timeline, probably having a June, maybe even early July election. So this will drag on awhile. We're ready to do it now. You know, unfortunately for my taxpayers in Wisconsin, this baseless recall effort is gonna cost the taxpayers $9 million on top of the fact that we're probably gonna see 60 to $70 million worth of ads and attacks and everything else out there which I think most people are just sick of. But in the end, that's the way the law is, it is what it is. Assuming they have enough valid signatures, we'll have the election by midsummer. But I think it's one of those that's important not only in Wisconsin, I think it's important across America, not only for 2012 but more so long term. And that's why I think the big government unions are so invested in this."